Ballet Cat is best friends with Sparkles the Pony. When Ballet Cat wonders what they can do to play, Sparkles suggests many different ideas–all of which are almost perfect. Finally Ballet Cat convinces Sparkles to play ballet. 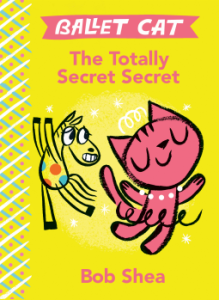 Only Sparkles has a secret secret. *Gasp* He doesn’t like ballet as much as Ballet Cat does. In fact, he is tired of constantly playing ballet. But Ballet Cat has a secret as well. This is a fun new series that early readers are sure to enjoy. The illustrations are bright and full of bold colors and thick, black outlines (as seen in Bob Shea’s picture books “Dinosaur vs.” series). The expressions on both of the characters are fantastic in that they show a wide range of emotions with a bunch of circles (circles for the eyes and squished circles for the mouths). And the text bubbles also showcase the emotions of the characters. There are smaller fonts for when whispering or being unsure of the reaction as to what is being said or large and bold when fuzed with loud emotions. Readers will come away not only enjoying these two new characters and the story, but also understanding a bit more about friendship and emotions. I can’t wait to read more in this fun new series!